We are getting error "DM_CRYPTO_E_PASSWORD_DECRYPTION_FAILED" for ldap password while starting repository, can anyone please suggest for this issue ? The LDAP password is stored in a file under $DOCUMENTUM/dba/config/. I don't remember the exact name but it's something like ldap_.cnt. Perhaps you didn't copy it over. If you did It's possible that the encrpytion algorithm is different between Solaris and Linux (I remember that inline passwords had to be reset after migrating). Either way, best option is to recreate the password file via Documentum Administrator: Go to Administration / Basic Configuration / LDAP Servers, view properties of the dm_ldap_config object and set the password. thanks bacham3. i am working with akjajoo. The problem is that we are struck in between upgrade and getting the above error. We are not able to access DA for making ldap configuration changes. Is there any way so that upgrade installer can by-pass LDAP configuration? we are getting attached error before repository upgrade completes. [DM_SERVER_F_CANT_CREATE_TICKET_MANAGER]fatal: "Unable to create ticket manager on server startup. Likely reason is corrupted aek.key file or docbase config object. The server will shutdown." 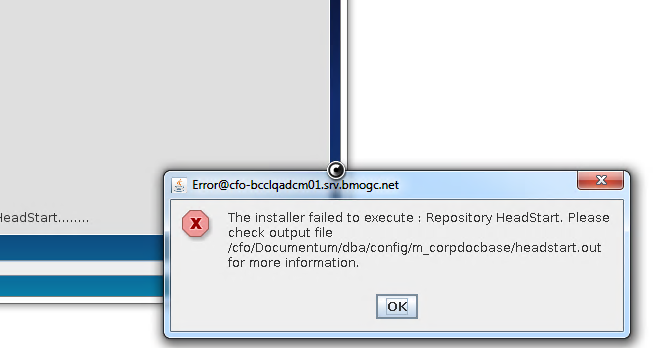 Try to set dm_server_config.ldap_config_id to '0000000000000000' directly via SQL. Are you sure that you copied the original aek.key prior to upgrading?